Microsoft Teams, the Slack competitor has today bagged one of the biggest updates since its launch earlier last year. And Microsoft itself is touting this fact about its Teams platform, adding that the new functionalities will enable users to work better with apps. It has brought the platform closer in functionality to its arch-nemesis. 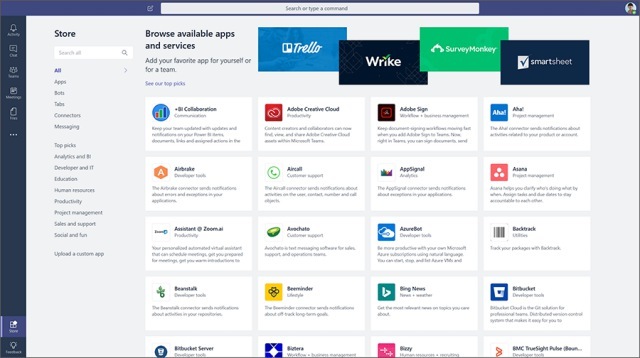 With the introduction of a native app store, Microsoft Teams has simplified the search and discovery of app-integrations. You can now search for apps you (and your peers) want to integrate in the workflow based on name, category, or integration type. This store is quite similar to what we’ve already seen on Slack and can come in handy for attracting teams to this tool. You can integrate apps and services such as Office 365 tools and apps from Microsoft’s partners, including Trello, InVision, and SurveyMonkey. This update lays much emphasis on third-party app integrations, which will now be present across the board and come in handy when you need them. Microsoft Teams allows you to bring in content from an app directly into the chat or channel without the need to go through the troubles of taking a screenshot or linking the app. You’ll now see an interactive card from the app you’ve linked in your team chat/ channel. In addition, Microsoft Teams is making it easier to launch apps straight from the command box. The latest update brings the ability to search for info inside an integrated app, such as Adobe Creative Cloud, and insert the needed result into a team channel or chat with ease. This reduces distractions (number of clicks) and integrates everything into a single workflow, making services accessible via an “@” symbol in the command box. This has been one of the highlight features of Slack and Redmond is now adding this ability to its Teams platform as well. Slash commands are generally used to replace certain tasks with shortcuts, which here you can type in the command box at the top to quickly perform a task, set your work status, navigate to other team channels or call a coworker. Slash commands are accessible, as you may expect, with a “/” symbol that you can type in to see the complete list of commands. 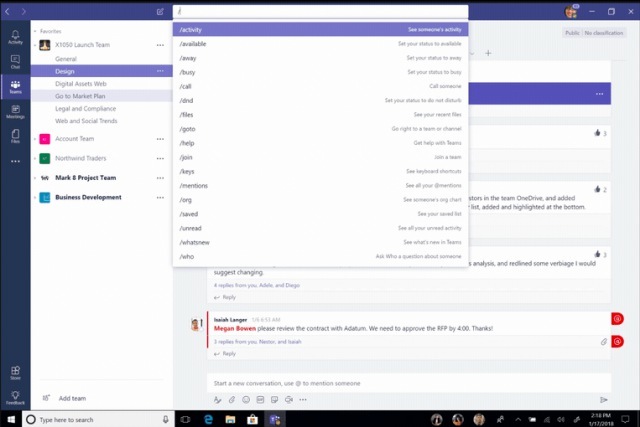 Lastly, Microsoft Teams has introduced a new “personal apps space” which makes it quite simpler for every member of a team to view all the items they’ve have been assigned to across apps and services. It could be tasks in Planner, issues that cropped up in Jira Cloud or notes in OneNote. The noteworthy addition to the personal space will, however, have to be Redmond’s very own new app called Who. The Who app is powered by Microsoft Graph and enables you to search across your organization via name or topics. This is one of the better new features that make Microsoft Teams more useful for your organization. So, planning to make a switch from Slack, are you? Let us know your thoughts down below.